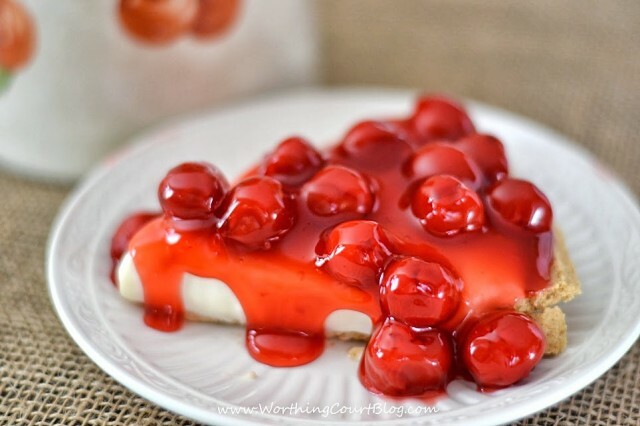 This no-bake cherry pie recipe is perfect for any time of year, but most especially right now when the cherry trees will soon be blooming! It’s the perfect blend of sweet and creamy with just a little bit of tartness, courtesy of the cherries. It only takes 5 ingredients plus a pre-made pie shell and is a snap to prepare. 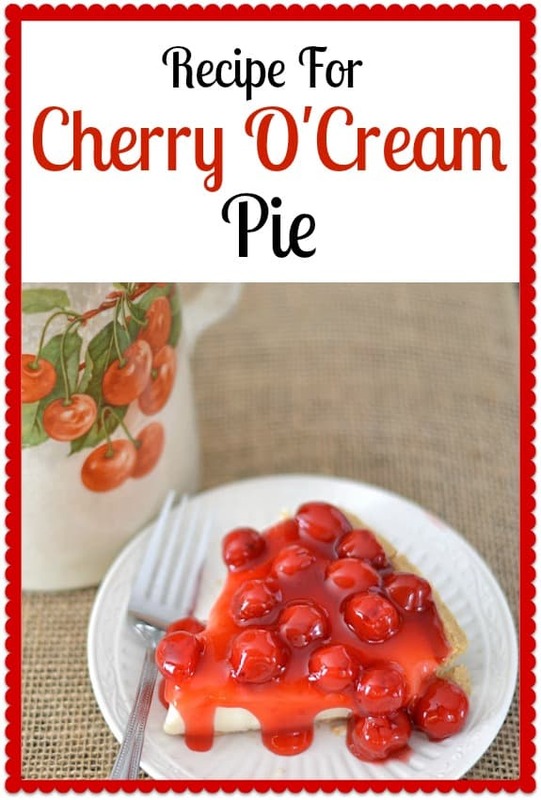 A delicious and easy to prepare cherry pie that is the perfect blend of sweet, tart and creamy. In a large bowl, beat cream cheese with an electric mixer at medium speed until creamy. Gradually beat in condensed milk, lemon juice and vanilla. 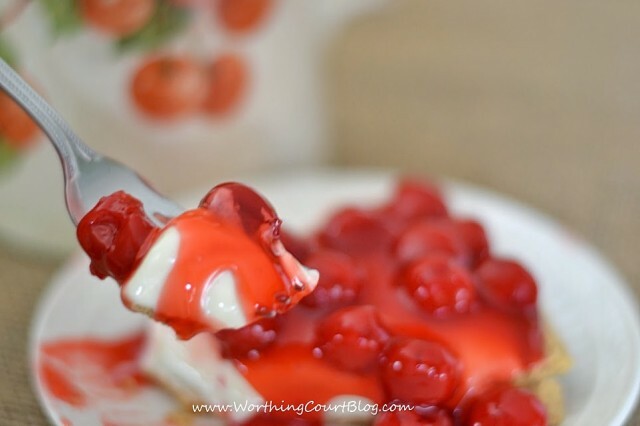 Spoon cherry pie filling evenly over chilled pie. Hi Mary. Maybe your hubby can use this recipe and make it! 😀 That mug is actually an old, old, old crockery pitcher handed down from my grandmother. I had intended to show the whole thing in one of the pics, but it didn’t photograph well. This sounds wonderful and easy! I would love it if you would share it at my Tasty Tuesday party going on now! LOVE LOVE LOVE this wonderful recipe!!!! And so easy! I have my vignette done and ready to go. So excited to be a part of Swing Into Spring! I adore this recipe! And love the fact that it’s easy. You know I like that! Thanks for sharing, Suzy! hi nanama!!!!!!!!!!!!!!! !how dare you make the cherry pie without me. next time you make it, i want you to share or save some for me. the pie looks so good that i just want to grab the pie right out of the cumputer. you are a great cook and i want you to cook all of your good recipes for the rest of your life!!!!!!!!!!!!!!!!!!!!! love you! We c;an make it together any time you want to. I love you too!!!!!!! Sounds scrumptious and looks delectable! My hubby would love this. Love the fact that it is a no bake dessert too. Ooo yummy! My husband would like this! This is a really nice recipe, perfect for winter. You get all the flavors of a cheesecake without all the fuss. I’d love to try this.